Bringing together locals and artists in an integrated art performance, Petrit Halilaj’s Shkrepetima will revive Runik’s long-forgotten, decrepit house of culture this Saturday. In the Drenica region of Kosovo, some 60 kilometers away from Prishtina, hamlets are scattered about like blobs of ink on a rough canvas. Next to the towns Skenderaj and Drenas, which barely number 10,000 people each, the valley’s lush meadowlands stretch between the multitudes of small settlements, each with a unique hue. The longer one spends driving through the area’s rustic roadways, the more one notices the layers sustained by its historical bedrock. Beyond the verdant tranquility lie tenacious scars of war, which often rise to the surface and are commonly mentioned in the same breath as the region’s own name. Digging deeper, one finds further remnants of former Yugoslavia, traces of medieval societies, and even bits and pieces from time immemorial. One specific village called Runik has garnered exceptional attention since the 1960s for its extraordinary richness in ancient archaeological artefacts. Sitting in a run-of-the-mill cajtore – a traditional teahouse – in the center of the village, I meet Petrit Halilaj, a Kosovo-born, Berlin-based artist. Petrit Halilaj in Runik. | Photo: Atdhe Mulla. 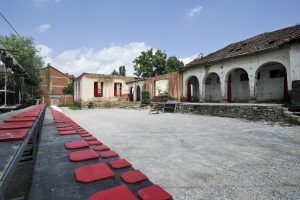 Halilaj, a well-known international artist who won a special mention in Venice last year, has returned home to organize the first cultural public event in Runik for the past 20 years. Called Shkrepetima (Flash of Light) after the defunct village school newspaper, the event is an integrated art performance that includes music, theater and contemporary art installations scheduled to take place on Saturday in front of the village’s decrepit house of culture. “Sometimes I come back here to reconnect. I went to speak to my teacher, and [the locals] were talking about when they were young actors, and what they did. The theater here was a big hit,” he said. According to Halilaj, there were about 4,000 such culture houses across former Yugoslavia, many of which today are only shadows of their past glory. Built in the 1950s, the culture house in this village was home to a library that at one point housed around 11,000 books, a theater where local actors staged plays regularly, a cinema, a concert hall and small shops. Conversations with former resident actors, many of which still live in the village, served as inspiration to Halilaj to hold Shkrepetima in and around the remnants of Runik’s culture house. The House of Culture in Runik. | Photo: Atdhe Mulla. Halilaj, who was born in a smaller village off of Runik called Kosterrc, studied art in Milan and has had numerous international exhibitions, most recently at the New Museum in New York. Much of his work has a biographical element to it: his exhibition in New York had ample recreations of Neolithic relics found in the village, and in 2011 dug up a large hunk of land from his home village and showcased it in Basel. “I had so much fun these past months, it feels like I was reborn. I feel lucky, because this is probably the last moment I could have done this, a lot of the actors are around 70 years old, some have become forgetful,” he said, as we approach the outer columns of the building. As we walk around the building’s brick walls, Halilaj says that the frequent public events in the culture house, which in many ways exemplified Runik’s local identity, came to a halt with the breakup of the Yugoslav federation. With most houses destroyed during the Kosovo war in 1999, Runik residents paid little attention to the disintegrating house of culture and it eventually became an informal dump site. Shkrepetima’s team, which is made up of various artists and volunteers, including many residents of Runik, cleaned up the space. “We removed around 16 trucks worth of garbage from the area, I was surprised how a place that had such a significant importance to the people,” he said. 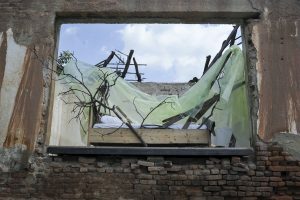 In addition to the clean up, since February, Halilaj and his team have been researching the history of the region and that of the house of culture. By December, the team hopes to publish a catalog with their research and take the performance to exhibitions in Italy and Switzerland. But their main event is this Saturday: a performance which tells the tale of a boy from Runik who falls asleep in the ruins of the house of culture to wake up to a dreamworld that drags the audience and the whole space into play. Sounds of the ocarina, an ancient Neolithic instrument discovered not far from the center of the village, will stir the rubble, beckoning the return of Runik’s once vibrant cultural life. The scene for Shkrepetima. | Photo: Atdhe Mulla. “The ocarina will introduce the performance, and it will serve to awaken the theater. 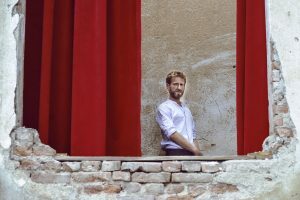 It connects prehistory with present times, but also with the history of the theater itself,” Halilaj explained. “We will use the building itself as a musical instrument, the stones, wood, the glass panes, the doors, the walls, the roof,” he continued excitedly. Within the boy’s dream, a collective of 30 actors, half of whom are from Runik, will perform snippets of plays that were once integral pieces of Runik’s theater program. The performance will end with a special concert by Andrra, the nom de plume of Fatime Kosumi, who reworked a few Albanian folk songs into electronic tunes for this performance. Shkrepetima will also include video projections, light shows and intricate theatrical scenes. “Together, [the plays] form a new story. They are presented as memories, not as wholes, thus create a new understanding,” he said. Much like a bright flash of light, Halilaj hopes that Shkrepetima will start a conversation about the importance of collective memory, and the necessity of reconnecting to our not-so-distant past. As most youngsters in Runik leave the village after reaching a certain age, Halilaj says that is essential for the people of Runik to dust off their link with the culture house and the history of the area as a whole. “The only way that we can make something happen in Runik today, something that connects the past to the present, and the past generation to their memories, is to do something in the culture house… The culture house was a mirror of how the people felt, and their dreams,” he said. Shkrepetima will start at 9 pm on Saturday, July 7, at the House of Culture in Runik. Free transportation from Prishtina to Runik is available from the parking lot behind of the Palace of Youth. The bus leaves at 18:30h.